A neat presentation will make your gift look even better. Your gift’s recipient will appreciate a gift more if it is well wrapped, on account of this increased appeal. However, getting it right can be difficult. You need to take into account the shape and size of your gift packaging. Gift baskets can be even harder to wrap because they have unconventional and uneven shapes, with sides that may be fragile. 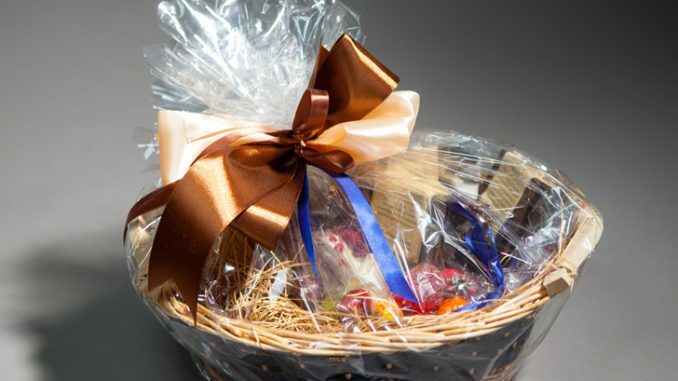 Here are a few tips on how to pack a gift basket. Cellophane is a lightweight transparent sheet that is made out of regenerated cellulose. The material is ideal for packing because it has low permeability to greases, oils, bacteria, water and air, which means that any packaged items can remain uncontaminated for a longer amount of time. Collect and arrange all your items in the gift basket, as well as laying out other tools for cutting, wrapping and sealing the cellophane. You may need packing tape, scissors, clear tape, and your cellophane sheet which will need to be about three times the size of your basket. After rolling out the cellophane sheet, place your basket in the middle. You should then fold the edges over the basket, with the front and back edges meeting over the basket. Twist your cellophane slightly to allow a better grip and add a bow around the neck of the package to wrap it up. You may seal the wrapped gift basket with tape to protect any awkward angles. The right bow can make a gift feel even more creatively done. It can hold down the gift, as well as make it look nicer. A simple over the top bow makes the gift secure, even though may be considered a little plain. A layered bow which is leaning off to one side may be used for chic gifts. A flowery bow might require a bit more effort, but it could make your gift more attractive to female recipients. A great quality bow may even be used on her hair, making the gift more memorable. Wrapping paper can be tied into a pom pom, which may then be tied as part of a bow. After wrapping, you should add a few more decorative items to make the gift more personal. It can involve adding beads, paper bows, stickers, bookmarks and other items that may have some meaning towards the recipient. This will make their gift more enjoyable, which could be the basis of a great gift. You could also include a personalized message or card alongside the embellishments. If you are using more ribbons to embellish your gift basket, you should make sure that it completely rolls out before cutting. Practice makes perfect when it comes to packing gifts. You should make a few attempts on a similarly shaped package to get the techniques. This way you will be better able to get it right on your first try. In case you want to secure your gift basket, you can add double stick tape to fasten any suspicious edges hold your gifts in.